Motor vehicles may be attractive targets for those who are looking to commit malicious mischief or any other criminal offense. However, these vehicles are very valuable to their owners and have the potential to cause serious injuries or property damage if operated in a reckless fashion. As a result the Legislature has enacted California Vehicle Code Section 10853 VC, which makes it a crime to commit malicious mischief to a vehicle. The defendant climbed into or upon a vehicle while it was in motion or at rest. The defendant attempted to manipulate the levers, starting mechanism, brakes or other mechanism or device of a vehicle. AND the defendant did so with the intent to commit malicious mischief. A man sees a brand new sports car parked in his neighbor’s front yard. The man wants to start the car and go joyriding. He jumps into the front and tries to manipulate the brakes and starting mechanism, however he is unable to get the car started. The man ultimately abandons his attempts to start his neighbor’s car. This man could still be prosecuted for malicious mischief to a motor vehicle under California Vehicle Code Section 10853 VC as the statute only requires that the defendant attempt to start the car in order to commit malicious mischief. In another example, a group of teenagers sneak onto a farm one night and find a tractor in a field. One of the boys climbs onto the tractor and starts it. The teen drives around destroying crops and eventually crashes the tractor into a barn. The teen in this scenario could be charged with malicious mischief to a vehicle in violation of California Vehicle Code Section 10853 VC. In a final example, a man is at home one day when his pregnant goes into labor. The man’s car will not start, so he goes into his neighbor’s garage in order to use his car to take his wife to the hospital. The man starts the car and drives off at excessive speeds to the hospital. The man would not be criminally liable under California Vehicle Code Section 10853 VC, as he lacked the intent to commit malicious mischief when he operated his neighbor’s motor vehicle. As described above, this offense requires that the defendant actually intended to commit malicious mischief when he or she entered a vehicle and attempted to operate it. If the defendant lacked the intent to commit malicious mischief, he or she would not be criminally liable under California Vehicle Code Section 10853 VC. 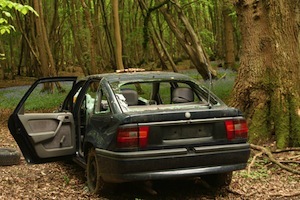 Malicious mischief to a vehicle is a misdemeanor level offense. Those convicted of this offense can be sentenced to serve up to six months in jail in addition to substantial court fines and any other conditions of probation that a judge may elect to impose. In addition to any penalties assessed in court, any criminal conviction could lead to significant collateral consequences for the defendant. The conviction would go onto the defendant’s criminal record and would be visible to employers, landlords and anyone else conducting a criminal background search. If you or a loved one have been accused of malicious mischief to a vehicle, it is absolutely critical that you discuss your case with a knowledgeable and experienced Los Angeles Criminal Defense Lawyer as soon as possible. As a former Deputy District Attorney with over 14 years of prosecutorial experience, Los Angeles Criminal Defense Attorney Michael Kraut has both prosecuted and defended those accused of crimes like this. Mr. Kraut understands that this offense may have been committed inadvertently and recognizes the serious consequences that conviction can carry. Mr. Kraut works hard to ensure his clients receive the most comprehensive representation possible. For more information about malicious mischief to a vehicle, and to schedule your free consultation, contact Los Angeles Criminal Defense Lawyer Michael Kraut at the Kraut Law Group located at 6255 Sunset Boulevard, Suite 1480, Los Angeles, CA 90028. Mr. Kraut can be reached 24/7 at 888-334-6344 or 323-464-6453.